Johnny Depp | The Reviewers Unite! If we’re gonna keep getting subpar dreck like Dirty Grandpa, The Fifth Wave, and Pride and Prejudice and Zombies, we might as well turn to the Internet for all our movie viewing needs… at least until Deadpool comes out, but AFTER that we can probably just hide away until March. So Funny or Die (the premiere site for famous comedians to post YouTube videos not on YouTube) has been secretly working on a Donald Trump movie and finally released it to the masses starring none other than Johnny Depp (the star of such classics as The Lone Ranger and A Nightmare on Elm Street) as the prominent business man in this adaptation of his most notorious literary contribution, The Art of the Deal. Does it manage to give us a satirical yet poignant look at the man who has taken over the public spotlight, or is this just a chance for even more people to jump on the Trump bandwagon before he flames out in the next couple of months? Let’s find out!! The movie is presented to us as a Made for TV special (found by Ron Howard in a yard sale) that Donald Trump (Johnny Depp) directed, edit, and starred in among other duties he takes credit for that is a somewhat autobiographical tale based on his best-selling book The Art of the Deal (second only to the Bible in number of sales apparently). The framing device for Trump to espouse his philosophy on business as well as tales of his prior accomplishments is a kid who steals a copy of his book from a display and just so happens to evade the security guard by ducking into Trump’s office who takes this opportunity to mentor the boy for an afternoon. It just so happens to also be Trump’s fortieth birthday and his one goal in life (at least according to this movie) is the purchase of the Taj Mahal casino in Atlantic City from Merv Griffin (Patton Oswalt) who’s not too keen to sell to the big blowhard… I mean brilliant business man. As Donald continues to try and goad Merv into selling, he goes on and on about his accomplishments with accompanying flashbacks and even gets his lawyer (Alfred Molina) to chime in every once in a while to reassure the kid of just how awesome of a life the orange demi-god standing before him has led. Will Donald get his hands on the Taj Mahal before the day is over? Will the kid learn a valuable lesson about business and negotiations along the way? Could anyone imagine a better time to release this than THE DAY that Trump won the New Hampshire primary!? This entry was posted in Cinema Dispatch and tagged ALF, Alfred Molina, Andy Richter, Christopher Lloyd, Donald Trump, Funny or Die, Henry Winkler, Jack McBrayer, Johnny Depp, Kristen Schaal, Michaela Watkins, Movie Review, Patton Oswalt, Paul Scheer, Robert Morse, Ron Howard, Stephen Merchant, The Fat Boys, Tymberlee Hill on February 11, 2016 by Matt Vetrano. We’re finally in Oscar season, right? I mean Straight Outta Compton was a huge hit, but this is the first one that Hollywood studios are actually pushing for some Academy nods. 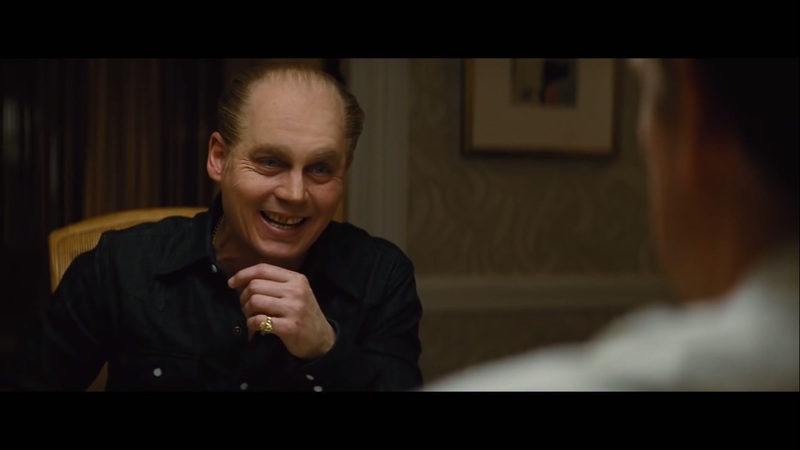 We’ve got a big name actor playing a dark character in an organized crime biopic! Hell, the only way it could have more Oscar appeal is if it was set in World War 2! Still, Hollywood doesn’t always get it right when the make big Oscar films (look no further than The Judge from last year) and Johnny Depp has had a PRETTY hard time of it lately (again, look no further than Transcendence from last year). Will this movie be the critical hit that Johnny Deep needs at this point in his career, or will this biopic get lost in the shuffle once the other big films of the season start coming out in earnest? Let’s find out!! 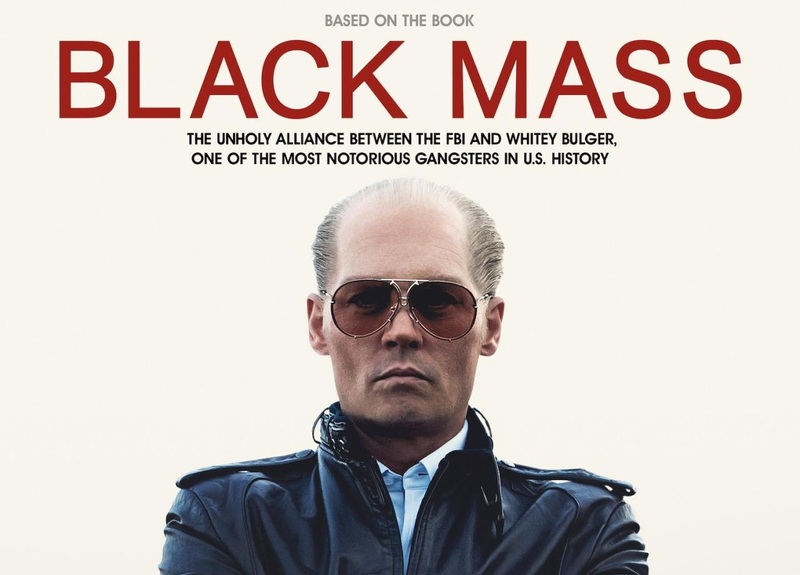 The movie is about James “Whitey” Bulger (Johnny Depp) who rose to the top of the Boston crime world due to the fact that was an FBI informant and was getting protection from them as he helped them take down the Italian mob. Once the Italian’s were out the way though, Whitey became just as big a nuisance for the city, only HE had a federal organization who was at least somewhat hesitant to reveal their own involvement with him so he ran pretty much rampant for a good twenty years (1975-1995). Presumably the story is a lot more complex with a lot more people involved, but for this movie the main players are Whitey himself, his brother Billy (Benedict Cumberbatch) who was the President of the Massachusetts senate at the time, and John Connolly (Joel Edgerton) who grew up with Whitey and became the FBI agent that got him involved as an informant. Needless to say that having these three working together (to some capacity) creates a neigh unstoppable force as each party is protecting the other to some extent and the trio (John less so than the rest who seems to be a SOMEWHAT legitimate politician) make a WHOLE lot of money. The gravy train can’t ride forever though as the rest of the world starts to close in and Whitey’s actions become more erratic over time. Will these men get the comeuppance they deserve, or will they be able to escape whatever’s coming after to them once they take things too far? Well it’s a biopic so you can look up the answers right now, but then why would you want to spoil the fun? You do NOT want to spoil this guy’s fun. This entry was posted in Cinema Dispatch and tagged Adam Scott, Benedict Cumberbatch, Billy Bulger, Corey Stoll, Hesse Plemons, Joel Edgerton, John Connolly, Johnny Depp, Kevin Pacon, Peter Sarsgaard, Rory Cochrane, Scott Cooper, W Earl Brown, Whitey Bulger on September 19, 2015 by Matt Vetrano.